Throughout its nearly 80-year history, it has been at the forefront of the Pepperdine University mission to create a dynamic learning environment that leads students on a journey of self-discovery, intellectual growth, and authentic expressions of faith with the guidance of faculty mentors. At the 40th annual Pepperdine Associates Dinner, award-winning journalist Lester Holt will explore the theme “Learn, Love, Lead, Live: Navigating the Hero’s Journey”—a guiding concept that illuminates the student experience and encourages all members of the Pepperdine community to become changemakers and leaders who promote a vision for a better world. The Pepperdine Associates Dinner will take place Saturday, April 9, at 6 PM at the JW Marriott Los Angeles L.A. LIVE in Downtown Los Angeles. At this milestone event, Holt will take the podium to share his own remarkable journey, reflecting on the heroes he finds in every story. Holt, father of Pepperdine alumnus Stefan Holt (’09), is one of the most prominent names in journalism today. 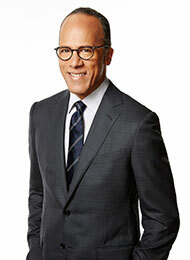 Now behind the desk of NBC Nightly News, America’s most-watched evening newscast, Holt has spanned the globe for decades covering major news events. In both triumph and tragedy, he is widely acclaimed for his commitment to his field as he shines light upon truth and the power of the human spirit. For more information, and to purchase tickets, visit the 2016 Pepperdine Associates Dinner website.